Smarty Pants is a big rugby fan, and because he’s part Irish he supports the Ireland national team. 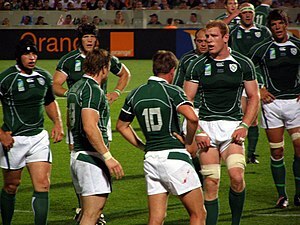 I’m a fan of big burly men, and because the Ireland national team has lots of big burly men I’m a fan of them, too. So on our wedding day, our best man (Smarty Pants’ brother) managed to get us a card signed by several of Ireland’s players, including the legendary Brian O’Driscoll. We have many photos of me jumping up and down in my wedding dress. He somehow got four All Blacks (the New Zealand national team) to pretend they were the bride’s ex-boyfriends and to wish the couple luck on video. This is priceless – especially Sonny Bill Williams (on the exercise bike), who’s got “romance hero” written all over him. Too bad the hero of my rugby romance novel is English, not Kiwi. That’s a freaking adorable accent. What’s the best best-man gift or trick you’ve ever seen? If it seems like I’ve been talking a lot about rugby lately, it’s because I’ve been rewriting my contemporary romance manuscript about a professional rugby player, and I’ve been doing lots of “research” lately (i.e. spending hours searching for videos of rugby players tackling each other and generally being uber-manly). Today’s been a particularly rugby-tastic day in the Latham household. My husband woke up early to watch the Rugby World Cup final, which apparently was quite slow. I slept through most of it, unfortunately, but watching the final few moments set me up well to work on my manuscript. If you missed the final, too, here’s how it started. The New Zealand All Blacks always do a traditional Maori war dance to psyche out their opponents. If I had to face those tongues, I’d be a bit freaked, but the Frenchmen stand their ground. Check out those arms. And quads. And asses. Seriously. In the afternoon, my husband and I went to watch a live match at the club where he’s a season ticket holder, and ideas for a series of rugby novels bounced around in my head. Fortunately, when I move to the Netherlands next week I’ll have lots of free time to write them! If the massive men doing the haka above don’t do it for you, then here’s an alternative video for you. Did you watch the Rugby World Cup final? What did you think?